Habitat and ecology: It occurs in rocky soil with good drainage in coastal vegetation together with Oxalis gigantea and Eulychnia breviflora, mainly in large ravines and valleys that reach the coast of the Region of Atacama, between 300 to 750 meters. It grow flat with the ground and is often covered by dark brownish sand and dust. 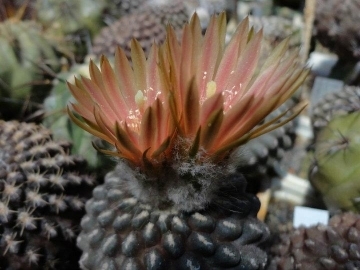 Description: Eriosyce napina var. 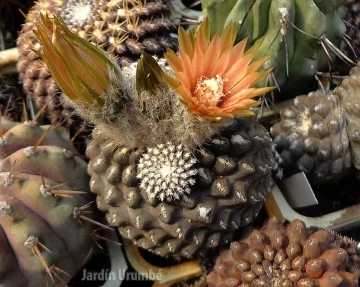 tenebrica is a slow growing, small geophytic cactus usually unbranched [or rarely branched], deep-seated in substrate. Stem: Dark greyish brown or greenish-black, spherical to flattened 2-4(-7) cm in diameter. Root: It has a 7-12 cm long, conical taproot sometime separated from the stem by a constriction neck. Ribs: 12, subdivided into somewhat angular tubercles 5-13 mm in diameter and 3-6 mm high, that are very blunt at top, without or with a very small chin and with separation furrows quite narrow. Areoles: At top of tubercles, not sunken, the flower bearing ones 3-8 mm long, 1,5-4 mm wide, grey felted, 3-12 mm apart. Radial spines: (0-)3-6(-7) thin, 1 to 2(-39 mm long, black, subulatae or curved, partially protruding. Central spines: Absent [or rarely one, very short]. Flowers: Appearing at apex from young areoles, closing at night, funnel-shaped, yellow to light reddish-brown 40-55 mm long, 30-55 mm in diameter at anthesis, with a variable fragrance. Pericarpel 7 mm Long, 8 mm thick, olive green, with 1-2 mm long with few narrow grey scales. Nectar chamber 2-6 mm long, lower part flat to deep bowl-shaped, purple becoming clear above. Flowers tube funnel shaped, 10-15 mm long,13-20 mm wide, inside pale, outside, as the pericarpel. Filaments 7-17 mm long white or pale yellow, ruby red above. Anthers cream. Style purple 24-32 mm long, stigma lobes 11-14 not or slight protruding above the anthers. Tepals 20-30 mm long, 4-9 mm wide, the midrib purple, paler at margins. Pericarpel and floral tube olive green, filled with long, fluffy, grey (never white) wool and numerous black bristles 10-20 mm long. Fruit: Elongate, 15-20 mm long, 10-15 mm wide, black-green becoming brown at maturity, dry, hollow, wind dispersed and opening by a basal pore. Seeds: 1,2 mm long, 1,0 mm wide, 0,7 mm thick, omewhat sticky, black, subreniformis, tubercled, hilum sub-basal, oval. Notes: The first description as Thelocephala tenebrica was made by Friedrich Ritter in 1980. 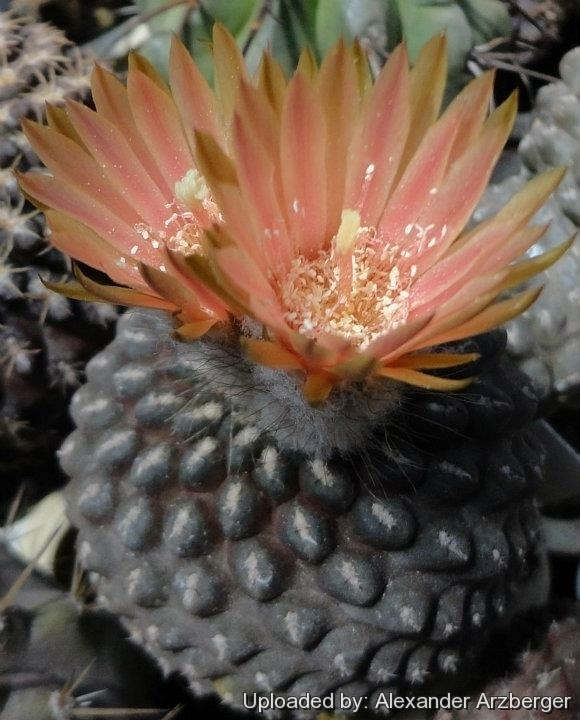 Fred Kattermann introduced her to the genus Eriosyce in 1994. 1) Friedrich Ritter “Kakteen in Südamerika: Ergebnisse meiner 20 jährigen Feldforschung.” Volume 3, Chile, 1980. 2) David Hunt, “Succulent Plant Research.” Volume 1, p. 119, Richmond 1994. 5) LUEBERT F. & P. PLISCOFF “Sinopsis bioclimática y vegetacional de Chile”. Editorial Universitaria, Santiago. 2006. Propagation: Direct sow after last frost (it usually doesn't produces offsets) or graft. Seeds can be sown in the spring or summer. The seedlings should not be disturbed until they are well rooted, after which they can be planted separately in small pots.